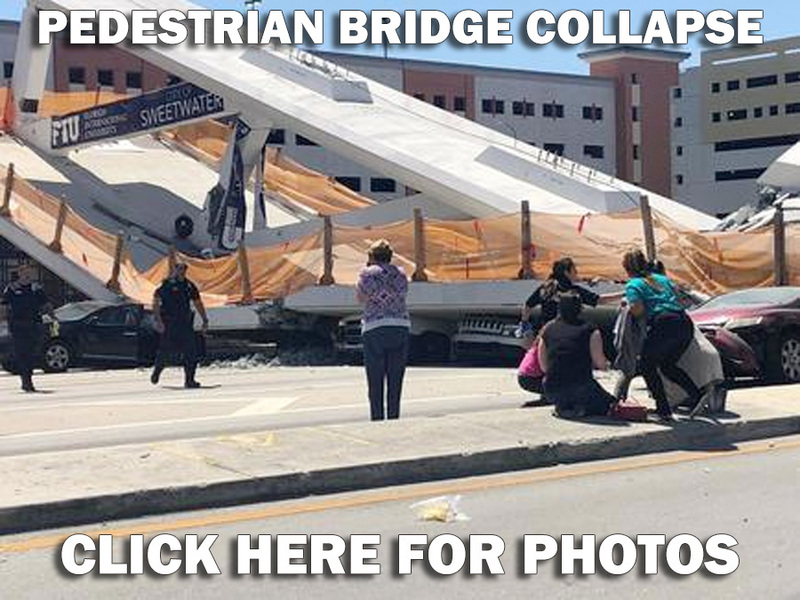 Two cars have been removed from underneath the pedestrian bridge that collapsed near Florida International University, according to the Miami-Dade Police Department. Three bodies were recovered from the two vehicles, officials said during a news conference Saturday morning. As of now, the death toll remains at six as officials work to extract six more cars from beneath the rubble. The vehicles removed Saturday morning were completely flattened after the 950-ton bridge fell. The cars were transported to the Miami-Dade County Medical Examiner’s Department, according to the MDPD. Authorities said Friday there could be more fatalities beyond the six deaths already confirmed in the collapse of the 174-feet concrete structure. As state and federal investigators worked to determine how and why the five-day-old-span failed, Miami-Dade Police Director Juan Perez told reporters at a Friday news conference he expects additional victims to be found. Authorities identified one of the victims Friday: Alexa Duran, an 18-year-old FIU student. NBC News reported that Duran was driving home from a doctor's appointment when the bridge collapsed on top of her car. Her best friend, Richard Humble, was in the passenger seat when it happened. He told the "Today" show that he and Duran had been at a red light when they heard a creak above them, just seconds before the bridge crushed their car. Humble said that it happened too fast for them to duck out of the way. He suffered a neck injury but was able to walk away, he told "Today." He told NBC News that although he feels "very grateful to be alive," he doesn't "feel so lucky right now." People who haven't heard from their loved ones congregated near the scene Friday. Jorge and Carol Fraga drove from West Palm Beach, fearing their relative's car was trapped beneath the bridge at Florida International University. Sixty-year-old Rolando Fraga, Jorge's uncle, lives in the area and frequently takes the nearby turnpike to work, but no one has heard from him since mid-day Thursday. Perez and Miami-Dade County Fire Chief Dave Downey said the decision to transition from a rescue to a recovery mission was made around 10 p.m. Thursday. "We are working with local officials, but we are conducting a separate investigation from criminal charges," said NTSB Chairman Robert Sumwalt III. Perez said that the Miami-Dade State Attorney's Office is on the scene investigating as well, but warned against jumping to conclusions. "This is a tragedy that we don't want to re-occur anywhere in the United States," Perez said. "We just want to find out what caused this collapse to occur and people to die." "Fire and us, we prepare for mass casualty events, but never a collapse like this," Perez said in an interview with radio station WIOD-AM on Friday. One factor in the tragedy may have been that adjustment that Miami-Dade Mayor Carlos Gimenez said crews were conducting on the span. A family reunification center is located on the campus of FIU in the Student Academic Success Center Room 100. Families were advised to access the building via SW 16th Street and 107th Avenue or call 305-348-3481. Rubio, who is an adjunct professor at the school, noted the bridge was intended to be an innovative and "one-of-a-kind engineering design." FIU President Mark Rosenberg said the bridge was supposed to be about "goodness." "Now we're feeling immense sadness, uncontrollable sadness," he said. "And our hearts go out to all those affected, their friends and their families. We're committed to assist in all efforts necessary, and our hope is that this sadness can galvanize the entire community to stay the course, a course of goodness, of hope, of opportunity." NOTE: This story has been updated to reflect that the current number of fatalities remains at 6, not 9 as previously reported.